Between my keto creamed spinach and garlic parmesan mashed cauliflower recipes, I have a few go-to options for hot veggie side dishes. But as the weather (finally!) begins to heat up, I’ve been looking for a way to get some veggies in without having to turn on the stove. Leafy green salads are a safe choice of course, but they aren’t super exciting to eat and the recent romaine outbreak left me looking for other options. Enter this keto broccoli salad recipe to save the day! 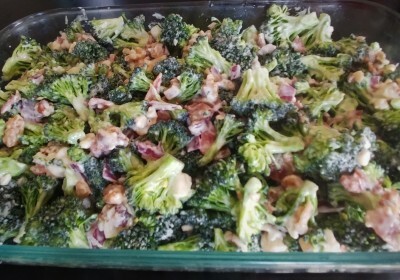 I usually prefer my broccoli steamed (and covered in cheese sauce), but it also makes a great base for this keto broccoli salad with bacon, blue cheese, and crunchy walnuts. 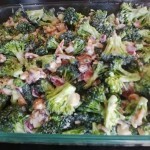 The mayo based dressing helps meld the flavors together and also mellows out the harshness that raw broccoli can have. And, aside from some chill time in the fridge, it only takes a few minutes to whip up. This keto broccoli salad is the perfect side dish for a spring picnic or summer barbecue. Per ~3/4C: 210kcal, 21g fat, 6g protein, 4g total carbs – 1.5g fiber = 2.5g net carbs. Combine mayo, vinegar, salt, pepper, and sweetener (if using) to make the dressing. Set aside. 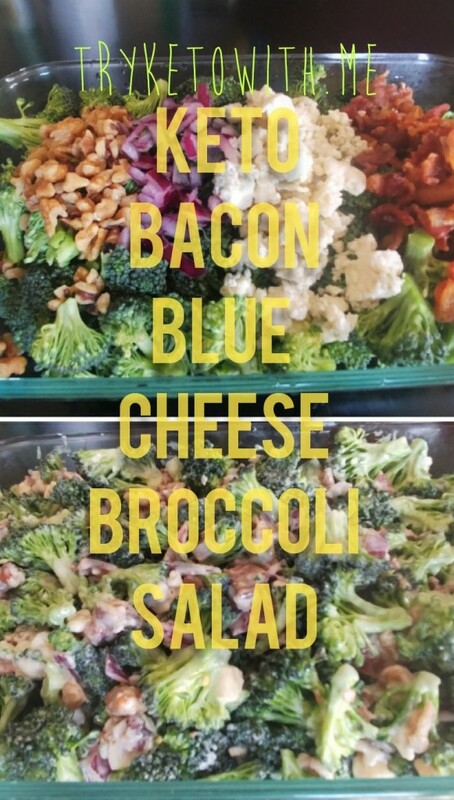 In a large bowl or dish, mix together remaining ingredients (broccoli, onion, blue cheese, bacon, and walnuts). Add dressing and toss to coat. Refrigerate for at least 1 hour before serving. Store refrigerated in a sealed container for up to 5 days. Any mayo should work for this keto broccoli salad recipe, even your own homemade keto mayo! If you don’t like/have walnuts, you can swap in sunflower kernels or another nut. Or just leave them out entirely. Similarly, if you aren’t a blue cheese fan, this keto broccoli salad recipe can be made with cheddar or another cheese instead. I’m not a huge fan of raw onion, so I added just enough here to heighten the existing flavors without it standing out strongly on its own. If you’re an onion fan, you can up the onion to 1/4C.